Orm's Return - "Heroes of Laur"
If a Microcorp Agent uses their Stealth Armor 15 to ignore the wound(s) inflicted by Deathwalker 8000's Rapid Fire Special Attack, can he keep attacking? If Deathwalker 8000 kills a squad member with his Rapid Fire Special Attack, can he continue to attack? As a Unique Hero that follows Utgar, Deathwalker 8000 may benefit from Ornak’s RED FLAG OF FURY activation synergy. As a soulborg, Deathwalker 8000 may be exploded by Executioner 616. 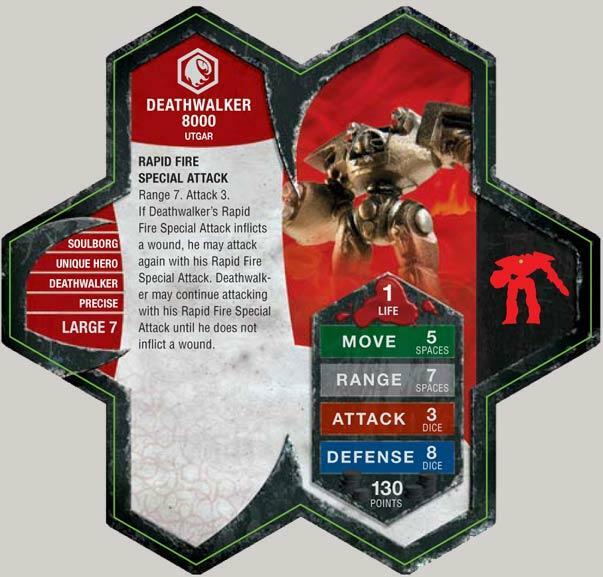 As a unique soulborg hero, Deathwalker 8000 can be upgraded by Beorn. As a Unique Soulborg Hero who follows Utgar, Deathwalker 8000 may benefit from Deathcommander Mark 3's activation synergy. As a Soulborg who follow Utgar, Deathwalker 8000 may benefit from Deathcommander Mark 3's MARKED FOR DESTRUCTION. so who's the better of the DW's? 9k, 8k, or 7k? I haven't honestly played with them enough (or 7k at all) to weigh in on this one. He's great for taking out Drake and Raelin. With his 3 Attack Special (rapid fire) and their 3 def he can sometimes take them out in 1 or 2 turns. Defit 9K. He has an extra attack, defense die then 8K for 10 more points. He also enchances Blastatrons which can't be that bad. While Deathwalker 8K isn't that great., he is a good counter draft to a viper/aubrien archer frenzy army. With all the low defense he'll wipe them out fairly quickly. Well at least until you blank out on his defense die. DW9k is the only one I've really given any play to. DW8K is my favourite. I've seen Rapid Fire do some pretty nasty things that Explosion would never be able to compare to. DW8K is a great counterdraft to a lot of units, the best I think is Arrow Gruts + Krug. This is seen as a strong competitive combo, with really low defense. The arrow gruts, even with a swoggy around, can get toasted by 8K. He can also deal a strong amount of damage to Krug in one turn from range. He also works well against other swarm armies, especially the low defense Ullars, and low defense heroes. He can be strong against Braxas, Drake, Syvarris, Laglor and Raelin. Better than 9K in my opinion... i have yet to play 7K, although he seems like the best character to hold a glyph (unless deadeye is around) and a strong Q9 finisher. As others have mentioned, DW8K is a situational figure great for counterdrafting. DW8K is solid against most viper/elf armies, orc horde armies, and McDirk armies. Throw in some rats for melee screening and Raelin for a shield boost, and you've got a force to reckon with... again, against the right opponent. (elf, viper, mcdirk, orc) But drafter beware... the curse of the deathwalker can strike at any time!... the solid blue field of death! I seem to have a lot more luck with DW 8000 than with DW 9000. But when playing a theme-focused game, it's fun to have them both, along with DW 7000 and the wee Zettians, too. Of course, as you know, this army is most likely doomed to failure. You guys must have better attack dice then me. I'm usually rolling 1 skull with 3 dice. I would say that 9k is better. Everyone I play against seems to forget about Explosion, and so keeps their units in a tight group. 8k, however, IS useful for taking out Krug (until Krug gets close. Then Krug smash. ).